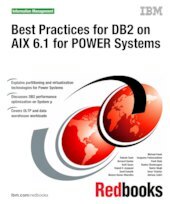 This IBM® Redbooks® publication presents a best practices guide for DB2® and InfoSphere™ Warehouse performance on a AIX® 6L with Power Systems™ virtualization environment. It covers Power hardware features such as PowerVM™, multi-page support, Reliability, Availability, and Serviceability (RAS) and how to best exploit them with DB2 LUW workloads for both transactional and data warehousing systems. The popularity and reach of DB2 and InfoSphere Warehouse has grown in recent years. Enterprises are relying more on these products for their mission-critical transactional and data warehousing workloads. It is critical that these products be supported by an adequately planned infrastructure. This publication offers a reference architecture to build a DB2 solution for transactional and data warehousing workloads using the rich features offered by Power systems. This book presents a reference architecture to build a DB2 solution for transactional and data warehousing workloads using the rich features offered by Power systems. It aims to demonstrate the benefits DB2 and InfoSphere Warehouse can derive from a Power Systems infrastructure and how Power Systems support these products. The book is intended as a guide for a Power Systems specialist to understand the DB2 and InfoSphere Warehouse environment and for a DB2 and InfoSphere Warehouse specialist to understand the facilities available for Power Systems supporting these products.